Blurb: Mara Dyer believes life can't get any stranger than waking up in a hospital with no memory of how she got there. My Review: Okay so I'm still a bit unsure on how I feel about this book. On one hand, I really like the mystery and the drama revolving around the protagonist and on the other hand, I just couldn't get myself to fully enjoy the story, mainly because of the whole romance thing going on between Noah and Mara. After reading so many books with a story about a dark, handsome, broody and *of course* filthy rich guy and the confused, troubled and oh yeah, full of secrets girl who doesn't give a craaapppp about the fact that the guy is loaded, these kind of stories just don't do it for me. I mean, COME ON. You can only take so much of the same kind of romance, right? Anyway, leaving the whole Noah-Mara angle behind, the mystery bit was interesting. On the first page, Mara says that her name ISN'T Mara which kind of keeps you wondering throughout the rest of the story if/when the truth about her name will be revealed. Since I hadn't check the genre of this book when I picked it up, I had NO IDEA that it was going to be a paranormal fiction, so when she ends up seeing ghosts, I was even more intrigued because up until then, this was just a mystery novel to me. When it comes to Mara's character, I'm not sure I'm going to be fan-girling about her anytime soon because even though I understood her reasons for being so out of sorts with everything, I just couldn't sympathize because instead of dealing with it, she just...let go and refused to accept the signs that something wrong was actually happening. Even if it wasn't, instead of taking help or accepting that maybe she was a little crazy, she just lies to others and herself. Now, I know a lot of authors do this to their female protagonists to show the slow transition if the protagonist from a weak, normal, mundane girl to some fierce, ready-to-take-on-the-world, strong chick, but I'm simply not a fan of these kind of transitions. There are a lot of other, better ways you can show the character metamorphosis WITHOUT making them plain dumb and stupid in the beginning. Basing the rest of your story by relying on the main characters' dumb-ness and refusal to accept what is happening is very frustrating to read. It's not even relatable because I know that if suddenly people started dropping dead just the way I imagined them to die a few hours before they actually boinked, I'd either accept that I'm the Goddess of Death or seek professional help. ASAP. Coming to Noah, well I have one word for him. Cliche. I'm not even kidding, he's such a cliched character that he checks ALL the boxes required to be a cliched male character in a book with a female protagonist. Honestly, it was fun to read about guys like him before, but now I just lose interest as soon as a character like this comes into the picture. Despite the loopholes and the issues I had with Mara and Noah, I still finished it because admittedly, I did want to know what was going to happen next. I was curious as well as intrigued which is the only reason why I want to give this book 3 stars. I'm definitely going to read the next book in the trilogy just to find out WHY THE HELL DID SHE SAY HER NAME ISN'T MARA. If you don't mind the characters being...the way they are and actually prefer them that way, this book is definitely for you as the rest of the story is not that bad and the supernatural as well as mystery elements are quite interesting to read. It gets better, I swear! I'm also not a big fan of Noah and Mara in this book and the romance is so meh. 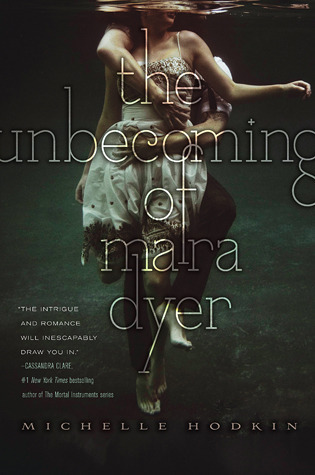 I gave Unbecoming 3 stars as well but The Evolution of Mara Dyer is AMAZING!